(CNN) -- Clashes between Somalia's transitional government and the Al-Shabab militia left 103 people dead and 420 others wounded, Somali officials said Friday. 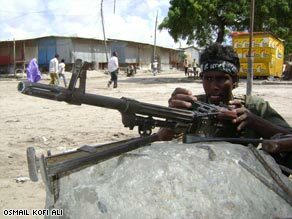 The fighting in Mogadishu between the rebel group and the government has raged for nine days. The fighting in Mogadishu between the rebel group and the government has raged for nine days, said Farhan Ali Mohamud, information minister of the Somali government. Human rights groups deplored the high number of casualties, urging both sides to comply with international law in respect to the civilian population. Thousands of families have fled the capital, Mogadishu, seeking a safer environment in camps south of the city. "The people of Somalia have once again been subjected to unbearable violence," said Pascal Mauchle, head of the International Committee of the Red Cross in Somalia. "The daily struggle for survival is exhausting their capacity to cope." Humanitarian groups expressed concern, too, that Somalis will not have access to medical care. The international medical agency Doctors Without Borders said it was forced to close an outpatient clinic in Mogadishu to ensure safety for its staff. "With so few medical facilities available in Somalia, it is crucial that people are able to access those that are still functioning," said Alfonso Laguna, head of the agency in the region. The new round of fighting stems from an interpretation of sharia law, or Islamic law, the spokesman said. Somalia's new President Sheikh Sharif Ahmed has recently approved implementing sharia law, but the rebel group wants the country to institute a stricter form. A spokesman for the rebel group said it has recruited many fighters for the battle against the government. "It is not only Somali jihadists that are fighting in Mogadishu against the government. There are also foreign Muslim jihadist brothers who are fighting side by side with us," said Sheikh Hassan Ya'qub, a spokesman for al-Shabaab. Abdiraman Abdi Shakur Warsame, minister of international cooperation for Somalia's transitional government, issued a stern warning to the rebels in an address to a young audience celebrating Somali youth day at the capital. "The government is determined to defend itself from these religious gangs who are covering in the name of Islam and I assure you that in the course of coming days, we will eliminate these elements and some of them will be forced out of the country," Warsame said. The U.S. Embassy in Kenya released a statement about the fighting. "The extremists who are instigating these attacks have no regard for the well-being of Somalis and are undermining the peaceful efforts of the legitimate government to further national reconciliation," the statement said. "The United States is particularly disturbed at reports that foreign fighters and those who rejected dialogue in 2006 are participating in this effort to forcibly remove a legitimate Somali government from power."